Queens Park Rangers boss Harry Redknapp says he is not losing sleep over the possible hostile reception awaiting him at Southampton on Saturday. Redknapp was in charge of the Saints when they were relegated from the Premier League in 2005, before leaving to take over bitter rivals Portsmouth. 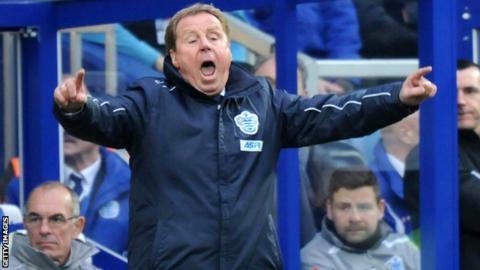 He takes bottom-of-the-table QPR to St Mary's on what is his 66th birthday. Redknapp leaves Southampton on 3 December 2005, with the club 12th in the Championship. "Listen, I will get a bit of grief, won't I? But what can you do? That's no problem," said Redknapp. Redknapp was in charge of Southampton for 12 months and the match is his first return to the club since he sparked fury among the fans by leaving to join Portsmouth seven months after relegation. "No-one was more upset than I was that Southampton got relegated. I gave everything I had," added the former Tottenham Hotspur boss. "I wouldn't say Southampton supporters are nasty, aggressive people. They're not. "They're good supporters and they'll give me a bit of grief but that's life. I accept that. I will just get on with it. "I won't lose any sleep over that. I will only lose sleep if the result is bad." QPR are bottom-of-the-table and need a win to ease their relegation worries. They start the weekend seven points from safety and have just 10 games remaining after their trip to Southampton. Redknapp has overseen victories over Fulham and Chelsea but his side are without a top-flight win in their last six attempts. "It is getting more difficult (to turn it round)," added Redknapp. "We need back-to-back wins. That is something we need to do." Southampton, whose manager Mauricio Pochettino will turn 41 on Saturday, are two places above the relegation zone on 27 points.